Nigeria's main trade unions have announced an indefinite strike and mass demonstrations from Monday unless the removal of a fuel subsidy is reversed. The withdrawal has led petrol prices to more than double since Monday, prompting anger countrywide. "We have the total backing of all Nigerian workers on this strike and mass protest," the Nigeria Labour Congress's Chris Uyot told the BBC. Nigeria is Africa's biggest oil producer, but imports refined petrol. 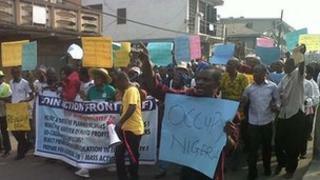 Both the NLC and the Trades Union Congress (TUC) have agreed to the strike. NLC spokesman Mr Uyot told the BBC's Focus on Africa programme there was no room for dialogue with the government, which has said it will spend the money saved by removing the subsidy on improving the country's erratic electricity supply, as well as on health and education. Media captionLamido Sanusi: "Subsidies should be subsidies for production and not for consumption"
Prices have increased from 65 naira ($0.40; £0.26) per litre to at least 140 naira in filling stations and from 100 naira to at least 200 on the black market, where many Nigerians buy their fuel. "After exhaustive deliberations and consultations with all sections of the populace, the NLC, TUC and their pro-people allies demand that the presidency immediately reverses fuel prices to 65 naira," a statement signed by the heads of the two unions said. If the government failed to do so," all offices, oil production centres, air and sea ports, fuel stations, markets, banks, amongst others will be shut down" from Monday 9 January, it said. "We advise Nigerians to stockpile basic needs especially food and water," the statement added. There has been a furious reaction this week to the fuel price increase - one protester was killed on Tuesday in Ilorin, Kwara state, and thousands of Nigerians have demonstrated in cities across the country. Nigeria's Central Bank Governor Lamido Sanusi told the BBC the subsidy - which he said cost the government about $8bn (£5.1bn) last year - was "unsustainable". "Subsides should be for production and not consumption," he told Focus on Africa. In December, the government released a list of the people who benefit most from the subsidy, which include some of Nigeria's richest people - the owners of fuel-importing firms. Years of mismanagement and corruption mean Nigeria does not have the capacity to refine oil into petrol and other fuels. Several previous governments have tried to remove the subsidy but have backed down in the face of widespread public protests and reduced it instead. The IMF has long urged Nigeria's government to remove the subsidy. Are Africa's commodities a blessing?